Did I lose you at vegan jerky? Hold on; let me explain. 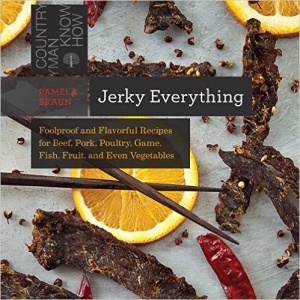 My friend Pamela Braun, creator of the food blog My Man’s Belly, sent me a review copy of her new book: Jerky Everything. So if you’re concerned about a lack of meat, DO NOT PANIC as the subtitle of the book is: Foolproof and Flavorful Recipes for Beef, Pork, Poultry, Game, Fish, Fruit, and Even Vegetables. I just chose to focus on a couple vegan jerky recipes because its more unexpected and did not involve handling raw meat. I took the plunge and bought a dehydrator and am really getting into it. It’s soothing fan is the soundtrack to this blog post, working away on some Hayton Farms blueberries from yesterday’s market. So what did I jerkify? I started with tofu. Yes, T-O to the F-U. Wait, that reads a little aggro. Let’s just stick with lowercase tofu. I do not say FU to tofu. My first foray into Jerky Everything was via a recipe for “Tofu Cheddar Crazy Jerky”. Now if you are wondering how the hell you can have a vegan recipe with the word “cheddar” in it, behold the magic of nutritional yeast. (Or “nooch” as my vegan pals call it.) 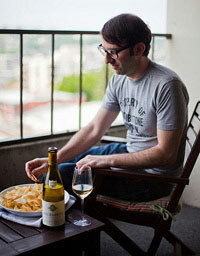 Nooch has a very parmesan-y, umami (ugh, I said it) type of thing going on. This recipe involves thinly sliced tofu brushed with a mixture of lemon juice, nooch, sea salt, and a pinch of cayenne pepper. Then off to dehydrate. Uh, I loved this vegan jerky. It was great solo and you should try adding it to a salad as well. What did I drink with this tofu jerky? I’m glad you asked. Tofu, nutritional yeast, and lemon aren’t probably the first thing that comes to mind when discussing jerky. That’s cool, because when it comes to talking about white wine grapes from California, Petit Manseng isn’t probably on the tip of your tongue. The mushrooms have a very satisfying, meat jerky-esque chew to them. Totally addictive. Now did I drink any wine with this Mellow Mushroom Jerky? Sadly, no. But I brainstormed on what wines would be best with it. There’s a lot of deep, earthy stuff going on here. And powerful flavors! I recommend a Syrah from France’s Northern Rhone. This is the home of the best Syrah in the world. And, unfortunately, with a price to match. If you don’t want to pass out into your jerky from sticker shock, explore the wines of the Crozes-Hermitage area of the Northern Rhone. These bottles provide a great introduction into France’s storied region for Syrah. 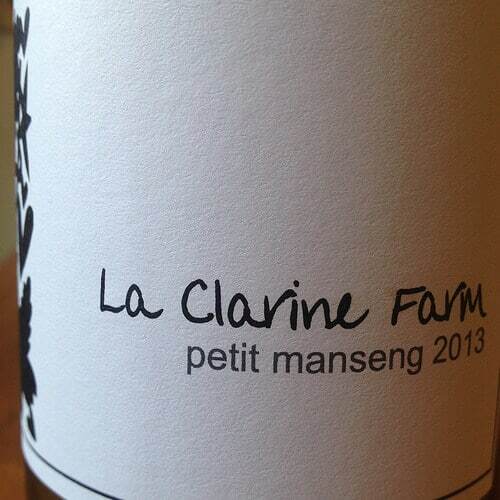 You can also check out a brawny, Grenache-based wine from the Southern Rhone. Try wines from the Gigondas or Vacqueyras regions. More powerful than your basic Côtes du Rhône yet not as expensive as Châteauneuf du Pape. Happy dehydrating and jerky making. Remember, you’ve got time to kill during the process so pour yourself some wine. In a 1-gallon resealable plastic freezer bag, thoroughly mix together all the ingredients, except the mushrooms, and allow the mixture to rest for 10 minutes. Add the mushrooms slices to the marinade and mix them around so they get completely coated with the marinade. Remove as much air as possible from the bag, seal, and place it in the refrigerator for 8 to 24 hours. During the marinating time, work the slices around so the marinade is fully incorporated into them. How about a recipe for a vegan parnsip pie that’s amazing for breakfast? A podcast with punk rock vegan baker Natalie Slater of Bake and Destroy? My sparkling appearance on My Man’s Belly? I’m so intrigued by this vegan jerky recipe! I’m considering a basic dehydrator lately and this would be a great recipe to try out on one. Cool! I bought a pretty standard, no-frills Nesco dehydrator. The only thing it’s missing is a timer. But Pamela has a cool tip to just plug it into one of those timers you use when you go out of town to turn your lights on/off. That way you don’t have to babysit your jerky. Jerkify? Love it. As a former English teacher, I am not sure that’s a word, but as a foodie, I am so rolling with it. The wine sounds wonderful and so does this book. Thank you. Oh my goodness, I have so many things to say about this. First, I had no idea that Pamela has a new book out! YAY for her! Second, “I do not say FU to tofu”…you are too funny! And third, I absolutely LOVE the idea of jerky-ing portobello mushrooms. I’m intrigued by her book as I didn’t know there was any other way to “dry” than a dehydrator. Really great post, Jameson, thanks! You’ll love the book. So many creative flavor combinations and it has her trademark wit generously sprinkled throughout. 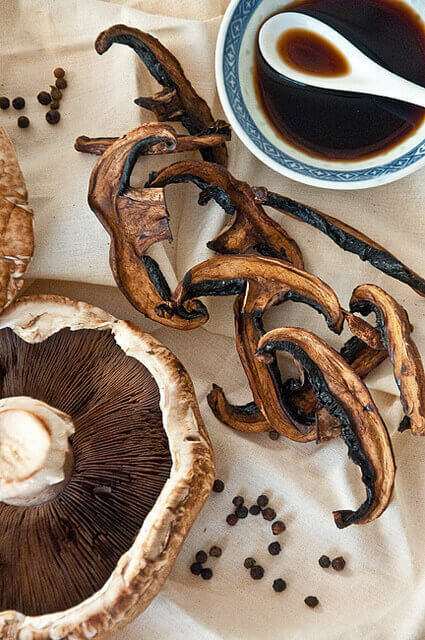 I usually say FU to tofu, but the mushroom jerky sounds intriguing…. It is. You’ll crack open some Hermitage, no? I was definitely intrigued not lost when I read vegan tofu. I’ve often considered dehydrating fruits but never thought about tofu. I like the added touch of wine. Love the unexpected pairings…it’s unique and sounds unexpectedly delicious. You would have thought ‘let me have some wine with my jerky’! Very cool! Thanks. I can’t get enough of my dehydrator. Maybe that sounds a little weird but it is super-versatile. Ooo! I want to jerkify a bunch of stuff, too, but especially these mushrooms! Love this. I don’t have a dehydrator so I’ll have to either check out the book or do some experimenting (or both). Glad to hear you are inspired; happy jerky journey! I am very excited to see vegetable jerky. I recently bought a dehydrator. Cannot wait to try it.